First up – and most import – the Customer Appreciation Event last time was held at Treasure Island – I am not sure where this years will be yet – but I do have some memories of Treasure Island! First up, Cisco Live 2009 was in July and the average temperature is around the mid to low 70’s. This year the event is in May, and the average temperatures are in the 60’s – so you should be prepared for some cold evenings. Back in 2009, I think most of us came close to freezing – it was VERY VERY chilly! Below is a historical chart from 2012 from WeatherSpark that shows the average temperatures for San Francisco in May. Yeah, it might get chilly! Other memories from Cisco Live 2009 are that the event was spread across two buildings – Moscone North + South and Moscone West. 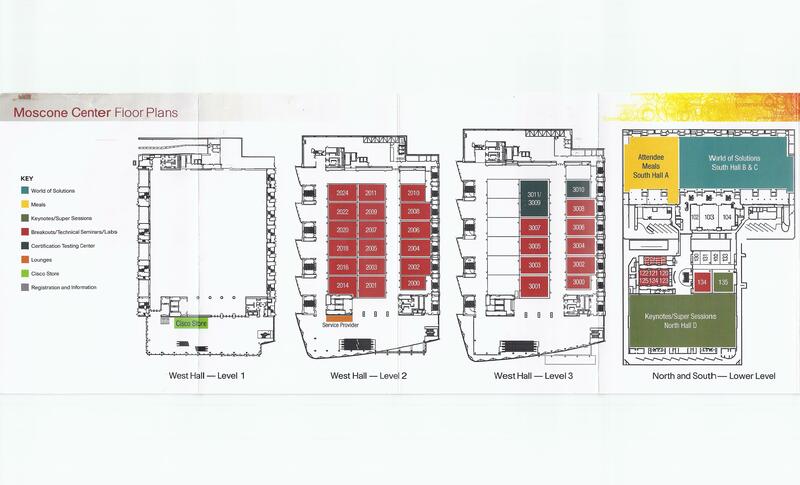 Moscone West is the building you normally associate with the WWDC Apple Event – it is a beautiful 3 story building as you can see in the picture below (picture courtesy of Moscone Center). Moscone West is also where the majority of the classes were held in 2009, I would almost guess that this will be the same in 2014. Moscone North + South are catty-corner to Moscone West as you can see from the Google Map below. Moscone North + South is where the Meals, World-of-Solutions, and the Keynote were held. There were also some classes in this building, but not that many. Now keep in mind that this was 2009 and the attendance was around 10,000 – no where near what we had in Orlando in 2013 (that was closer to 20,000 according to Cisco – link. I am sure that what we experience this year with classes will be different that what we had in 2009! Ok, recap and trip down memory lane is over. Now onto Cisco Live 2014 info! There are 4 registration packages available this year – Registration Link – Full Conference, IT Management, Explorer +, and Explorer. Most attendees take the Full Conference pass as this allows them access to everything – the WoS, Tech Sessions, CAE, etc. 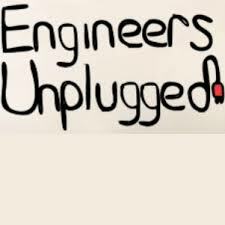 One quick note here on registration – if you want to attend the event but are not interested in the Techtorials (classes), you may be interested in what is called a Social Event Pass. This pass allows you access to the World of Solutions, CAE, and all the Keynotes and is only $195 per the registration page. Might be an option if you are unable to attend the full conference but will be in town during the event. You can see a map of the hotels in the image below, if you click the image it will take you to Google Maps so you can see where each hotel is located. I make no guarantees on accuracy of the map, I just entered the names and saved them to the map. The official list of hotels can be found here – Official Cisco Live 2014 Hotel List From the look of it, most of the hotels are within mile of the event, so easily walking distance for most of us. There are hotels with shuttles as well, in the PDF link they have an asterisk (*) next to their name to denote this. The local airport code for San Francisco is SFO (20 minutes from Moscone), but you could also fly into Oakland (OAK – 30 minutes) or San Jose (SJC – 60 minutes ) if you wanted to. Just keep in mind traffic will have an impact on these times depending on your flight! You can use a shuttle service ( I have used Super Shuttle in the past – they are OK but remember it is a shared ride ) or you can cab it from the SFO airport. For an idea of costs from SFO – Cab will be about $50–65 each way, a shuttle from Super Shuttle will be about $20 each way, or Super Shuttle ExcuCar will be $85 each way. You can always rent a car too, but be aware that most (if not all) hotels will charge for parking. So what can an attendee expect from this event? Well that is simple, ALOT! There are sessions that range from beginner to expert and beyond. You want to learn about OSPF basics, they have a class for that. You want to learn about what it takes to design a Nexus switch, they have had classes for that. One year I sat a Cisco 3750 Switch design class that even included how much of the hardware, ASICS, and how things worked in such a detail that it was amazing! I will never look at that switch quite the same – it was like a walk to Mordor you learned so much on the way! As for NetVets, those of us who have attended 3 of the last 5 Cisco Live events, we can expect our normal routing – but there is one difference this year – the books. When I registered last month, the only option for books was Electronic Copies, so I guess no more hard-copies of books for us. I will miss that as I liked having the hard-copy of a book. Maybe I am old skool or maybe I just like having post-it notes sticking out of my books where the good information is. I dunno, but I wish we would have had the option of hard-copy. 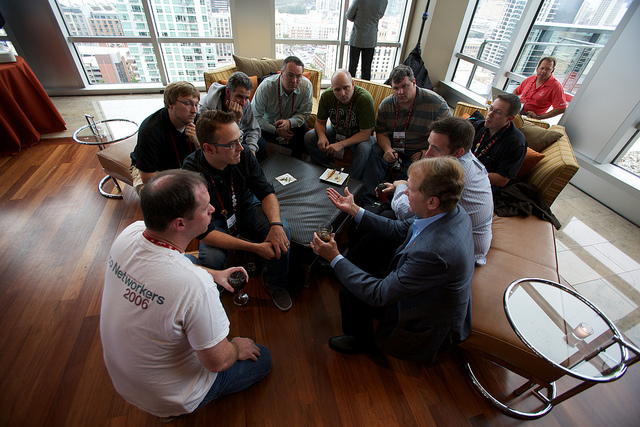 The lapel pin is give out at the CCIE/DE NetVet reception with John Chambers. This is probably one of the best parts about being a CCIE/DE NetVet at Cisco Live. This time with Mr. Chambers and his team is just amazing! You can get up-close and personal with him. 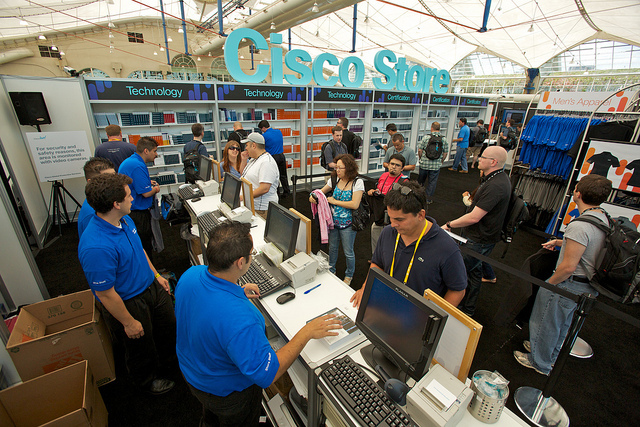 If you have never attended Cisco Live, you should know that there is a Cisco store at the event. The store has everything from clothing, to knickknacks, to bags, and a huge selection of Cisco Press books. Below is an image from Cisco that of the Store for you to see. Oh, one really cool thing that Cisco Press does is a “Meet the Author” book signing from time to time. Watch for their schedule to be posted as the event looms closer. There is one item I picked up last year at Cisco Live that I still use to this day – it is a battery pack charger for a Cell Phone. The batter pack uses solar to charge its batteries, and its batteries then charge your cell phone. It is nothing fancy, just something simple that I keep on my desk so that it is ready to go when I need it. Below is a picture of mine (I only have one charger, so the image below is a photoshopped photo to show both sides) with all of its accessories. You will notice that it does not have a charger for the iPhone 5/5s, but it does have a USB port so you can use your iPhone USB cable for charging your iPhone. It is no Mophie case, but it works well in a pinch! The CAE, as it is called, is a wild and fun time! There is music, food, and a chance to just let loose and have some fun! This years CAE has not been announced, so look for a future post on that! Also on that note, the bag for Cisco Live has not been announced yet – so more on that when (and if) we find out ahead of time. One thing I would like to see them do with the bag this year is to build on Blake Krone’s suggestion of donating your backpack. There are programs out there where you stuff a backpack full of school supplies in a backpack to help someone who cannot afford the supplies – there are a few so I will not name any particular one. I would like to propose to Cisco Live is that they create a location for this function – a session that a person can use to donate their time and their backpack stuff it with school supplies to the kids. If you agree, please click on the tweet button and share your thoughts. Alcatraz – aka – the rock. This is an amazing and historical place to visit. To get there you need to take a quick cruise to the island. The cruise is run by Alcatraz Cruises and is very much worth the trip if you have the time to take it. Be aware that it is recommended to purchase your tickets in advance (current prices show $30 per-person) as this tour has been known to sell out. Below is a picture by user WPPilot that was shared on Wikipedia. Fishermans Warf – This is a neat little area that is loaded with restaurants and shops and is located on the bay about 2 miles from the Moscone Center. Not that close, but not too far either if you have the time. Just wanted to mention a great food places in San Francisco – Mel’s Drive-in. Mel’s Drive-In – What can I say about this place but IT IS AMAZING! When we where there for Cisco Live 2009, I think some of us ate there every day. It is just around the corner from the Moscone West and has awesome food for a great price. The atmosphere is of Mel’s Drive-in is based around the file American Graffiti ( IMDB Link ) and is just a good, fun time with some awesome food! I personally recommend trying the Avocado Burger!! The below image is courtesy of Mel’s Drive-In and is the actual restaurant located at 801 Mission Street. That about covers it for this post – I will share more as more information becomes available. Also. if you are looking for a Twitter List, Tom over at NetworkingNerd.Net will be running that list. I will put up a link when that list goes live. Look forward to seeing you at Cisco Live US 2014! Oh, and watch for more posts on Cisco Live US 2014 in the near future! Click here to register if you have not!